As the leaves begin to change colors, I am becoming more and more excited at the change of seasons.. as well as the books that will be read. As I made my monthly visit to my bookstore, I knew that I had to find a book that spoke about my mentality. I have been noticing that as I am working on getting my Bachelors Degree, my mindset has been determining my outcome. I’ve been learning that it is up to ME to get my mind right . 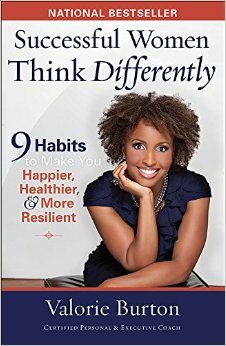 I walked into the self-help/improvement book and saw the title “Successful Women Think Differently.” Immediately my spirit leaped because I knew I had to buy this book. The book was written by Valorie Burton, an executive and life coach who wrote this book to teach women the 9 Habits to Make You Happier, Healthier, and More Resilient. I was completely in all while reading the habits because I knew this book was about to prepare my mind to receive all I had asked the Almighty for. There were three habits in particular that really stood out to me on this journey to a victorious mindset. A majority of times we assume that because we ask God for success we will not encounter obstacles, hard times, and detours. But because we are rising to higher levels, we will encounter resistance and it is up to US as the Single Wives to prepare for it. This is not to say we are expecting defeat, it is saying that we become resistant against resistance. We become EQUIPPED and we become PREPARED to not only fight, but to win. Now anyone who knows me knows that I am a creative soul. I am pretty sure one of my love languages is writing 😉 So I know that whenever I acquire an idea (whether personal or business) I immediately write it down. I try to always bring some type of paper with me whenever I leave my place because I expect ideas to come to me. The power of the pen is REAL and God has given us this beautiful gift so that we might use this to write down the concepts, lessons and ideas He has deposited into us because they lie WITHIN so we have the responsibility of pulling them out. Now as you know this was my absolute FAVORITE point in the book. A lot of times we have faith in our friends, our bank account ( well sometimes), or our co-workers but we doubt ourselves. Well that season is OVER, honey it’s time to believe in what the Almighty has placed within you. How do you expect to receive all you have asked for if you don’t believe you are worth having it? This week choose to align your mentality with your vision and purpose. Eliminate anything (or anyone) that seeks to poison your spirit. Shift your mindset and watch the increase, the elevation, and the blessings flow. And yes the opposition will come but you will only experience defeat if you have a defeated mentality, you must make the conscious decision to only expect victory. You are no longer fighting for victory, but from it. Werk Queen Werk.